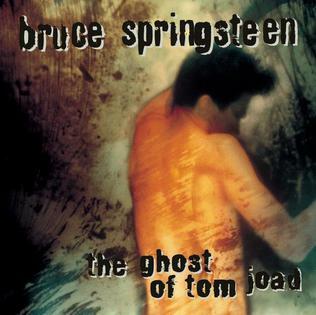 Today marks the 20th anniversary of The Ghost of Tom Joad, Bruce's 11th studio album, and second acoustic album, following 1982's Nebraska. Coming after the dual release of Human Touch and Lucky Town, this album came out at arguably the nadir of Springsteen's popularity. While Bruce would later regain his swagger seven years later on The Rising (discussed extensively on this blog), today is a time to look back on 90s Bruce. The Ghost of Tom Joad is an album that I have listened to very little, and have discussed even less. In fact, in the process of writing this review, I realized that I was missing a couple tracks. And after a few listens, I find myself, unfortunately, with very little to say on the album. The album starts off very strong, with album stand-outs such as the title track, "Straight Time", and "Youngstown". (It is notable to point out that "The Ghost of Tom Joad" and "Youngstown" would eventually be worked into full-on rock songs, versions that this author prefers). There is a lot of strong lyrics on this album, too. For example, the "where there's a...." part in "The Ghost of Tom Joad", while lifted from the book, is particularly strong - so strong, in fact, you can find similar sentiments in future songs such as "The Wrestler" and "We Are Alive". Bruce's musical work here excels when there is a band accompaniment, as they add diversity and flourish to a rather bleak album. However, the back half of the album drags, as many songs begin to blend together. The formula is the same on many songs: Bruce's voice is high in the mix, an acoustic guitar plinks in the background (sounding like a guitar-practice progression), and the songs go on without a strong beginning or ending. A string of songs like "Balboa Park", "Dry Lightning", and "The New Timer" just waft over me, and it is difficult for me to find anything that stands out musically. Ultimately, I don't find this album offering much new to me; the bleak, stark storytelling was explored much better on Nebraska, and Nebraska had a bit more diversity of sound on it, from the Suicide-esque yipping on "State Trooper" to the random rockabilly track "Drive All Night". Even Devils & Dust, which owes some of it's sound to this album, has a few more memorable tracks than this one. While there's no offensively bad song on the album (although "My Best Was Never Good Enough" is a bit cheesy), I'd rank it last among the Bruce acoustic trilogy. However, having not really discussed this album much, I contacted the other writers on Legends of Springsteen. Both OB and Steve agreed - The Ghost of Tom Joad was their favorite of Springsteen's acoustic albums! This came as a shock to me, so let's put it to you, the reader: how would you rank Springsteen's acoustic albums? Song Spotlight - "Party Lights"